Three Cheers for My Chemical Romance-Inspired Pizzas! I brought Vinnie's Pizzeria in Brooklyn my money, they brought me a slice. Vinnie’s Pizzeria has been slicing up slices with the sharpest knives in Brooklyn since 1960. These days, Vinnie’s is known for its ethical practices, crazy pizzas and daily specials (AlKALEine Trio, anybody? 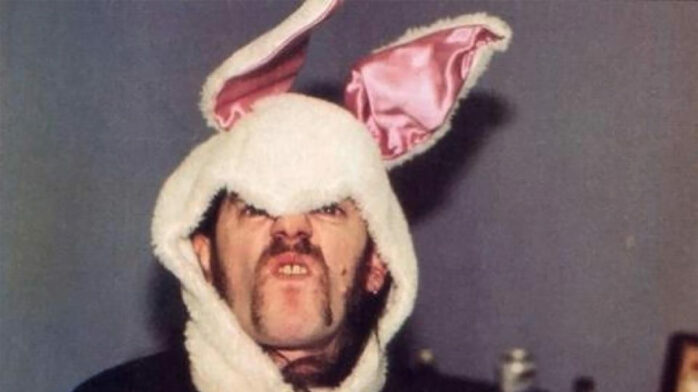 How’s about a From Here CHEW Infirmary?). 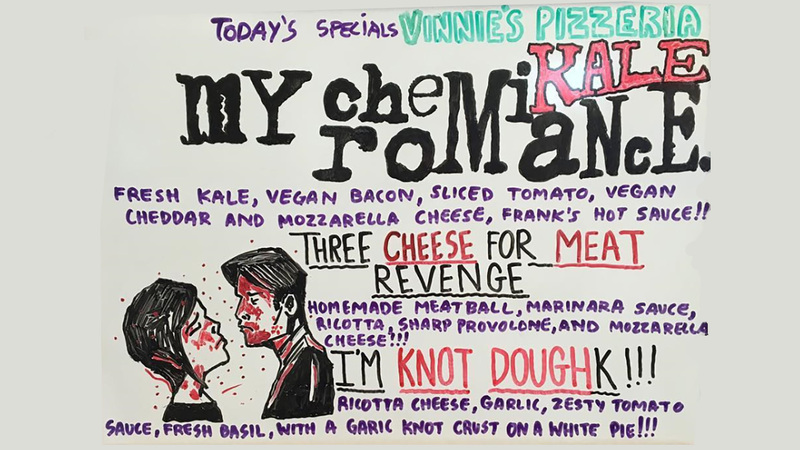 Recently, Vinnie’s received some love from My Chemical Romance guitarist Frank Iero for a slate of daily specials modeled after the beloved band, which broke up in 2013.
of all the days to not be in brooklyn… damn. The vegan option, My ChemiKALE Romance, came with vegan bacon, sliced tomato, vegan cheddar, mozzarella cheese, Frank’s Hot Sauce, and, of course, fresh kale. The vegetarian pizza was called I’m Knot Doughk!! !, was a white pie that includes ricotta cheese, garlic, zesty tomato sauce, fresh basil, with a garlic knot crust. For the flesh-inclined, Three Cheese for Meat Revenge was made with homemade meatballs, mariana sauce, ricotta, sharp provolone, and mozzarella cheeses, and provided local carnivores with the best day ever. We don’t mean to be a killjoy, but if you weren’t in New York City yesterday, you missed out. We’re pretty sure that My Chemical Romance pizza will never be served again.